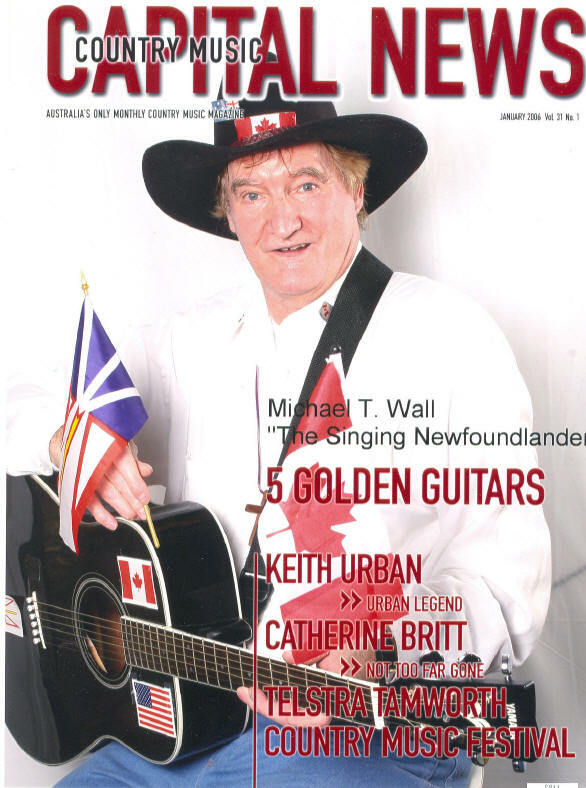 Michael T. Wall, The Singing Newfoundlander, was born in Corner Brook (Country Road), Newfoundland on Nov 2, 1938. In 1961, Michael moved to Toronto, Ontario, to pursue his dream, a career in music and promote his homeland to the rest of the world. 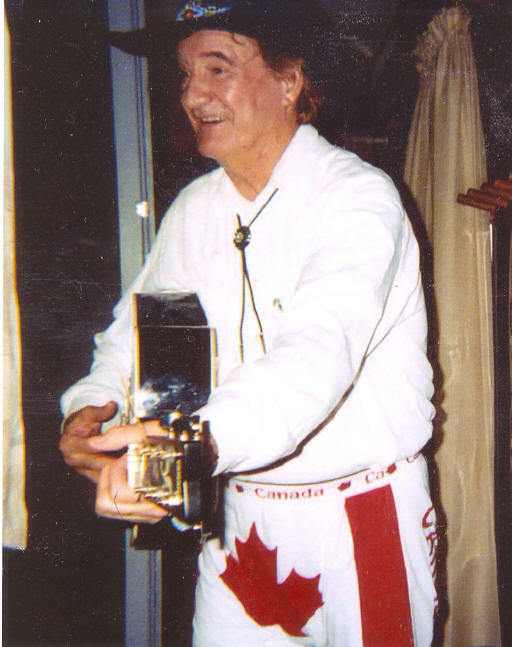 Now 40 years later, Michael is still performing in the music circuit and promoting his homeland and Country as well as promoting many other Canadian artists in music. 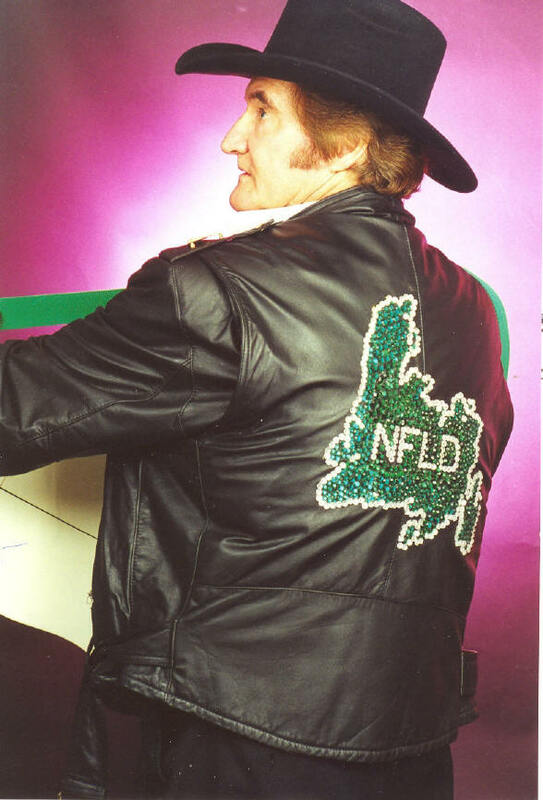 He is a living legend, always wearing his trade mark, (Singing Newfoundlander and the outline map of Newfoundland), constantly promoting Newfoundland. In the early days, Michael performed continually in Toronto, and as his popularity grew, he began to travel across Canada, the USA and even Europe performing & promoting. As time went on, his two daughters, Sarah and Sabrina joined him, performing as The Singing Wall Sisters. 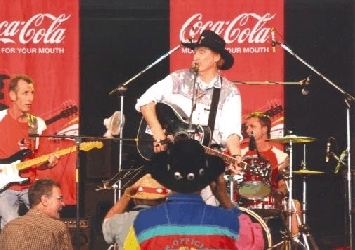 Throughout the years, he performed on The Grand Ole Opry, The Ernest Tubb Midnight Jamboree, & Tootsies Orchard Lounge in Nashville. He appeared with many Country Music Legends, such as Loretta Lynn, Dolly Parton, Porter Wagoner, Ernest Tubb and countless others. In 1984, he toured Poland, becoming the first Newfoundlander to sing behind the Iron curtain. 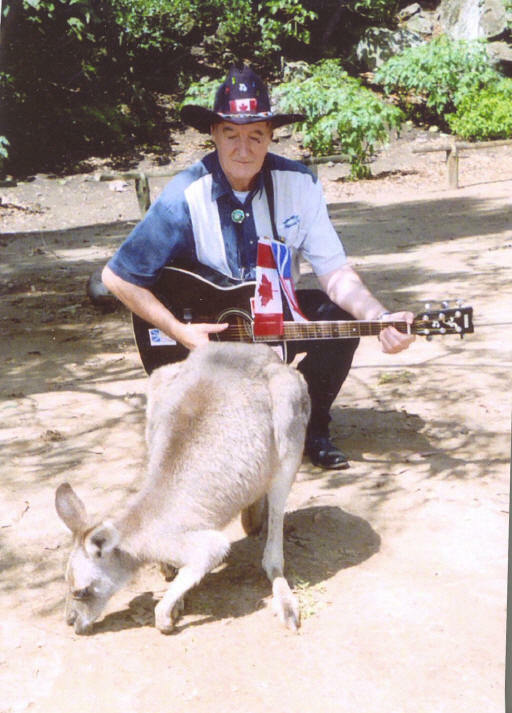 He records his music in Nashville and Canada and his music is heard in Canada, England, Australia, Belgium, Denmark, Poland, Germany and Japan, to name a few. His 1997 CD, entitled, 500 Years Ago, a John Cabot 500 tribute, has been a major success. Michael points out, that success doesn�t come easy, and doesn�t come over night. He struggled like all other music artists, to establish a singing career. He points out that dedication and determination eventually pays off. As well as being in the music business, Michael does acting jobs in movies as an extra, and has appeared in over two dozen films with actors such as, Al Waxman, Richard Thomas, Gordon Pinsent, Tom Jackson and Denzel Washington. Michael has been recognized as having helped to lay the foundation of the East Coast Music Industry, and for his overall contribution to the Industry on a world level. A self-promoter, he is known as, one of the industry�s best. For more information regarding Michael T. Wall and his music, visit his website listed above. Michael T. Wall travelled to Australia this past year, 2006. TV and Recording Star, Michael T. 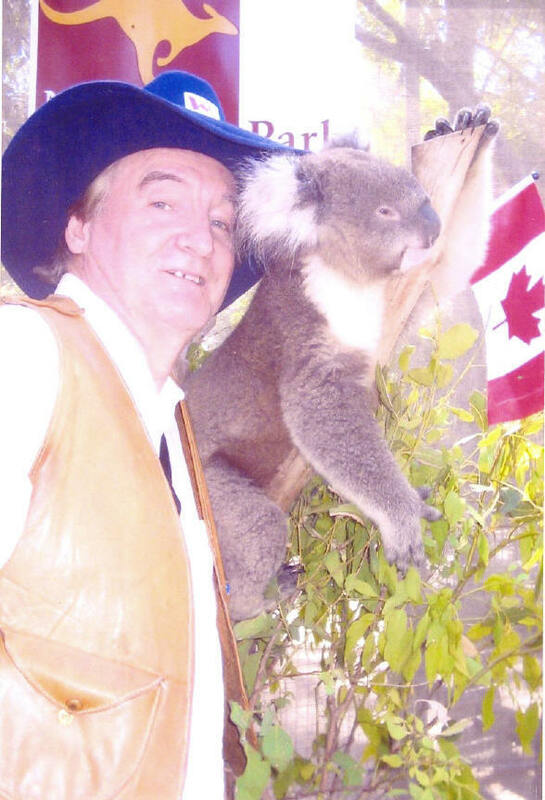 Wall., The Singing Newfoundlander accomplished a Lifetime Dream, when he traveled half way around the world to appear as a special guest star at the Tamworth Country Music Festival, Australia's biggest venue, where he proudly carried the Canadian and Newfoundland flag on the Slim Dusty Float in the spectacular parade. Receiving accolades wherever he appeared, inclusing TV, radio and newspaper interviews and a prestigious lunch with his worship, The Mayor of the City of Shoalhaven, where Michael T. was presented with a beautiful gift as a memento of his visit by Mayor Greg Watson and the citizens of The Shoalhaven. 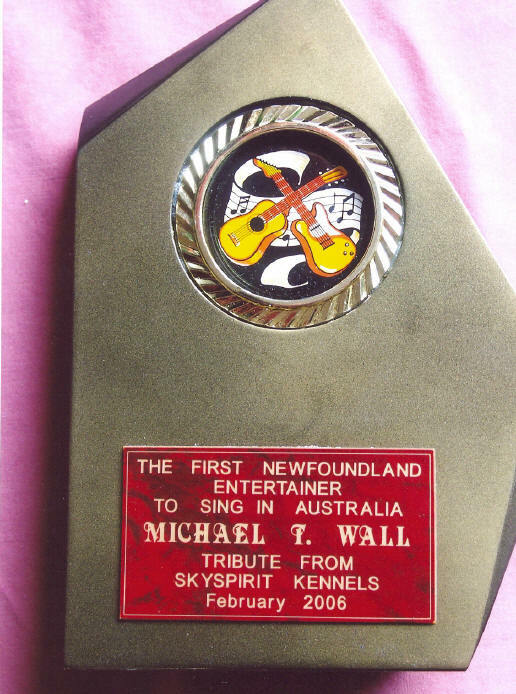 Mr. Wall also received a beautiful award from Sky Spirit Kennels, naming him the Very First Newfoundland Entertainer to ever sing and perform in Australia.